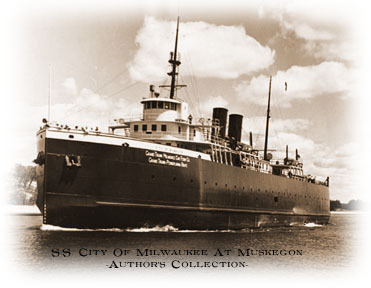 The S.S. CITY OF MILWAUKEE was the last of six ships built to the same design by the Manitowoc Shipbuilding Company. Built in 1930, she entered service for the Grand Trunk in 1931. Her sister’s included the PERE MARQUETTE 21 and 22, built in 1924, the ANN ARBOR NO. 7, built in 1925, the GRAND RAPIDS, built in 1926, and the MADISON, built in 1927. She was built to replace MILWAUKEE (formerly the MANISTIQUE MARQUETTE and NORTHERN 1) lost in a storm with all hands in 1929. The new carferry entered service as the Great Depression gripped the nation, so CITY OF MILWAUKEE soon became the Grand Trunk’s “spare boat”. She survives today nearly as-built; the only major modification was her conversion from coal to oil-firing. CITY OF MILWAUKEE was involved in relatively few mishaps during her career. One such incident occured on February 14, 1932 while she was docked in Grand Haven. Her sister-ship MADISON, was driven by a strong northwest wind and collided with CITY OF MILWAUKEE. Damage was minor. 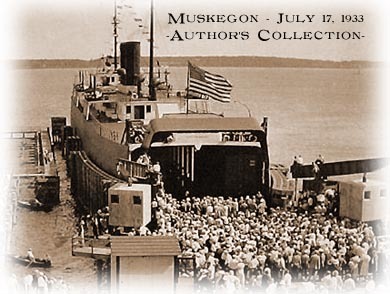 When the Grand Trunk’s operations were moved from Grand Haven to Muskegon, a new slip was built and CITY OF MILWAUKEE participated in the dedication ceremonies that were held in July of 1933. CITY OF MILWAUKEE survived the termination of car ferry service from Muskegon in 1978, and from Frankfort/Elberta where she was in service until 1982. In 1983, the City of Frankfort purchased the carferry from the Michigan Department of Transportation (MDOT), who by then owned her, for the grand sum of $2. The Society for the Preservation of the S.S. City of Milwaukee purchased the carferry from the city of Frankfort in 1988, also for the sum of $2. November 11, 1930 -- The CITY OF MILWAUKEE was launched at Manitowoc. She was sponsered by Mrs. Walter J. Wilde, wife of the collector of customs at Milwaukee. January 8, 1931 - The Muskegon Chronicle reported that the new CITY OF MILWAUKEE was expected to arrive Grand Haven on January 17th. January 17, 1931 -- The CITY OF MILWAUKEE arrives Grand Haven to a grand welcome. She carried a full load of Case tractors on flat cars. 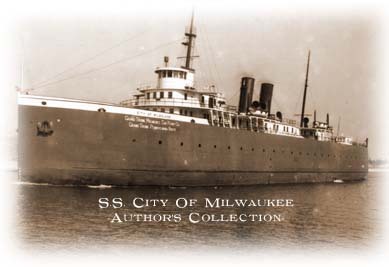 February 14, 1932 -- Sister-ship MADISON was driven by a strong northwest wind and collided with CITY OF MILWAUKEE. Damage was minor. July 17, 1933 -- The Grand Trunk carferry CITY OF MILWAUKEE took part in the dedication ceremonies of the new Grand Trunk slip in Muskegon. 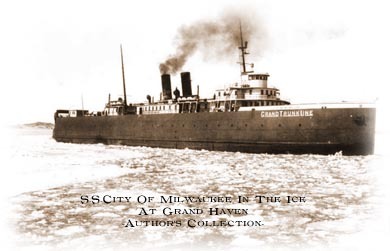 February 24, 1936 -- The CITY OF MILWAUKEE was stuck in the ice outside Grand Haven along with sister-ships GRAND RAPIDS. February 8, 1951 -- The CITY OF MILWAUKEE was trapped in the ice outside of Muskegon along with her sister-ship MADISON. November 1, 1978 -- The CITY OF MILWAUKEE made her last run for Grand Trunk’s rail car ferry service. November 11, 1978 - CITY OF MILWAUKEE steamed to Elberta to begin working on the Ann Arbor route. November 22, 1978 -- The CITY OF MILWAUKEE was chartered to the Ann Arbor Railroad Co. and started the Frankfort, MI-Kewaunee, WI service. August, 1981 -- The CITY OF MILWAUKEE ceased operations. April, 1982 -- The Ann Arbor carferry fleet ceased operations. December 6, 1983 -- Formal ceremonies were held during the afternoon as CITY OF MILWAUKEE was officially turned over to the City of Frankfort by MDOT. 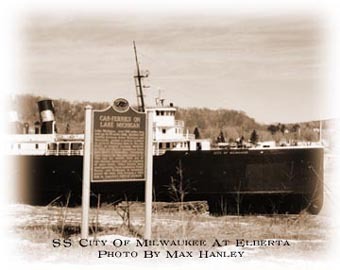 December 12, 1983 -- CITY OF MILWAUKEE was towed from Elberta across the river to Frankfort. October 17, 1988 -- The Society for the Preservation of the S.S. CITY OF MILWAUKEE purchased the carferry for $2. December 23, 1990 -- CITY OF MILWAUKEE was declared a National Historic Landmark. 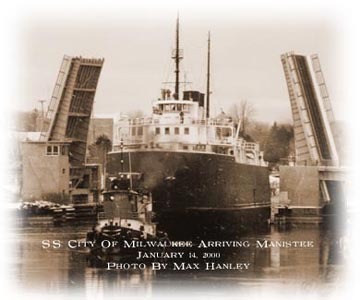 January 14, 2000 -- CITY OF MILWAUKEE was moved from Frankfort/Elberta to Manistee. April 11, 2000 -- CITY OF MILWAUKEE was moved to her new location at Manistee -- 9th & 10th St.